It's located literally straight across the road from the Gare de Manosque - Gréoux-les-bains, which is also a stop for many regional and inter-regional buses. 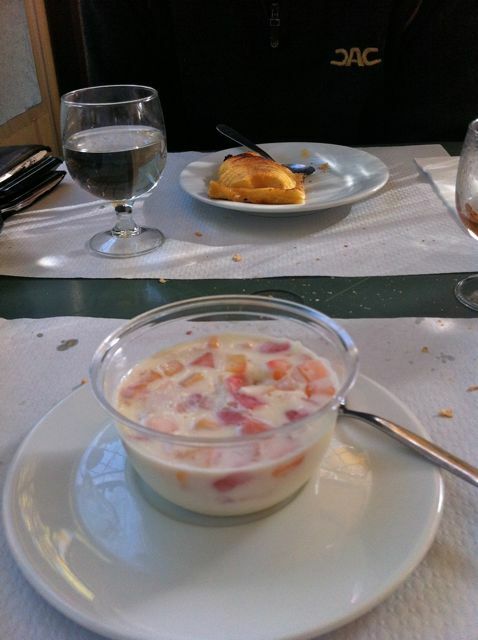 However, they offer a lunch menu for €14... for starter, main course, cheese, dessert and coffee... 5 COURSES! Oh yes, and there's a half bottle of wine per person thrown in as well! Let's just go over that again... starter, main course, cheese, dessert, coffee and wine - for €14! Well, you can't go wrong, can you? We both ordered the "menu," sat back and waited to be fed. 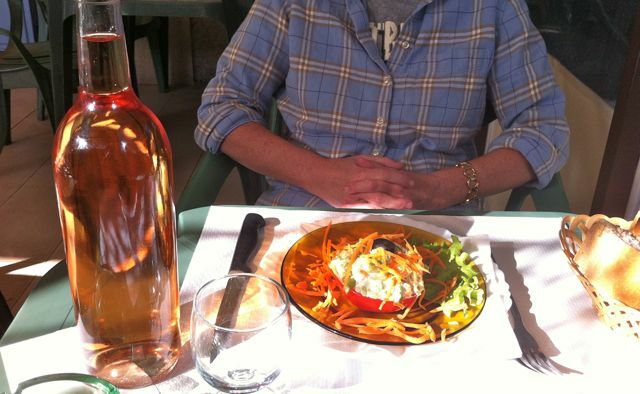 NB in France, if you ask for the Menu, you will be given the "Meal of the Day." If you want the menu, ask for the Carte. The starter was Tomato á la Russe, which turned out to be half a beef tomato, covered with peas and haricots in mayonnaise (this is the "á la Russe" bit), sitting on a bed of lettuce and grated carrot, served with a sliced up baguette. Ok, they were prepared some time beforehand and I'm guessing that the "á la Russe" bit came out of a tin and, but it was perfectly edible. The main course was braised pork, served with gnocchi and mediterranean vegetables (tomato and aubergine). I liked the fact that the bread was not whisked away after the starter, and it was useful to mop up some of the juice from the meat. 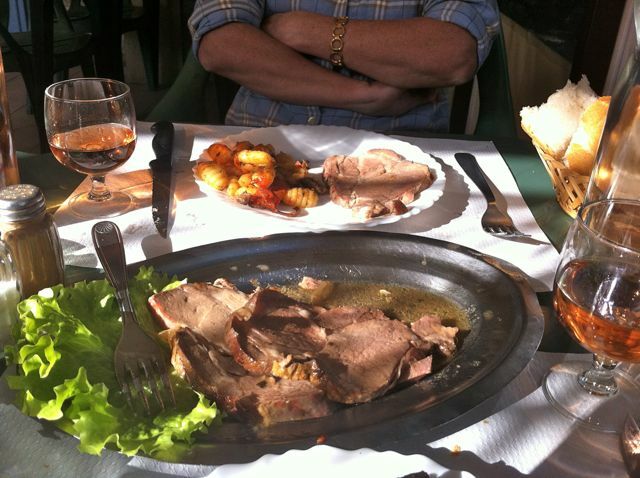 The meat was well cooked and tasty, but very plain. The gnocchi tasted fine but were a bit rubbery in texture and almost certainly came out of a packet, but at €14 for the meal, who's complaining? Oh. Well. Ok, it was cheese - a foil wrapped triangle of brie. The bread was still on the table, and it came in handy once again as a vehicle for the cheese. Again, nothing special, and we're not going to be extolling the virtues of the cheeseboard at the Buffet de la Gare, but there was nothing wrong with it, either. Well, the panacotta was clearly out of a packet and didn't have the best eye appeal, but, actually, it tasted pretty good. The apple pie looked a bit more attractive and also tasted pretty good. You won't get Haute Cuisine at the Buffet de la Gare, but you will get a hearty meal, served quickly, in relaxed surroundings. 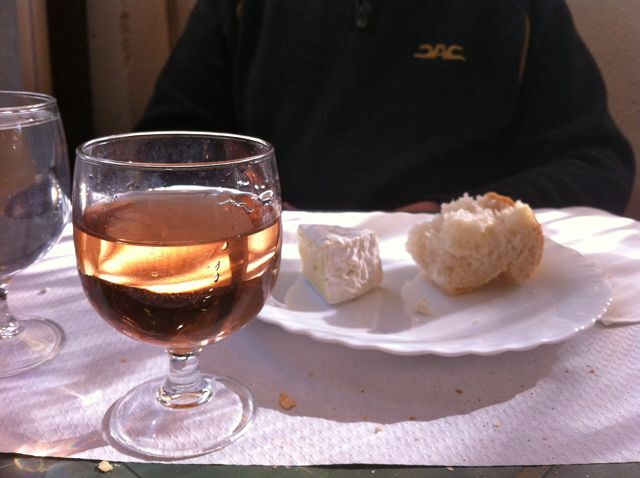 If you're a back-packing student, or you're simply touring Provençe on a budget and want to get stuffed (and nicely mellow thanks to the wine) at lunchtime in Manosque, look up the Buffet de la Gare. 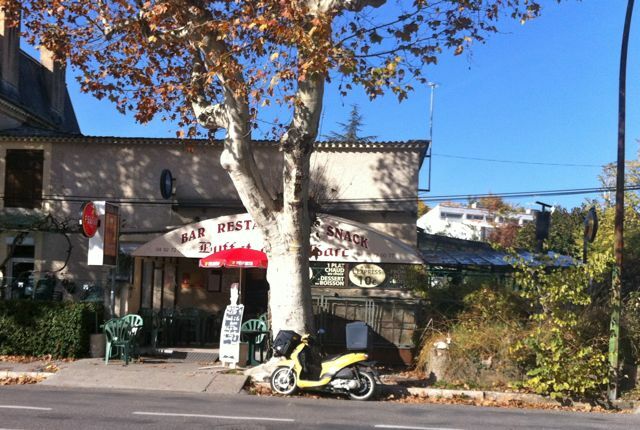 If you've just arrived into Manosque on a bus or a train at lunchtime and need to grab a bite to eat, walk across the road to the Buffet de la Gare and get your meal PLUS your half bottle of wine for €14. I don't think you will do better than this!